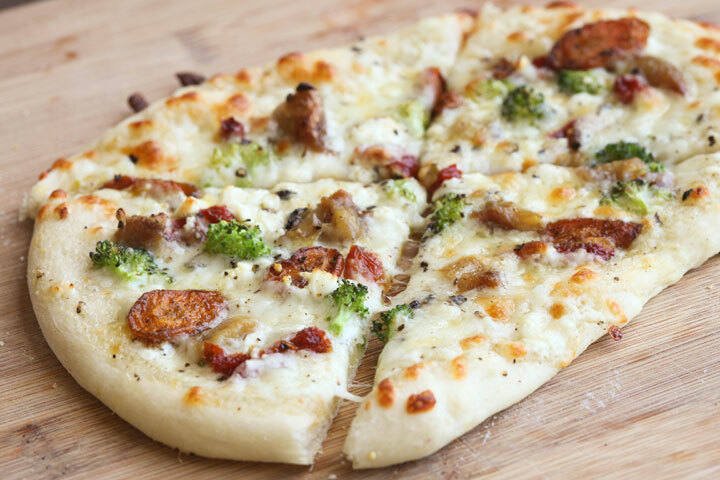 We’re eating rich white pizza with garlic, asiago & parmesan cream sauce, mozzarella, feta, curry roasted carrots, broccoli, roasted garlic, and caramelized onions. Election years are crazy in Puerto Rico. Daily there are unavoidable blaring trucks with speakers spewing out political propaganda. Nearly ever weekend there is a rally where dozens upon dozens of cars filled with supporters parade around town blaring those same political messages, honking their horns and drunkenly wave flags while straddling the car windows as they cruise through the narrow, pothole-ridden streets. Considering there are only a very limited number of streets to get around Rincon, avoiding them can be damn near impossible. Actually, I live less than a block from our current mayor’s (incumbent and reelected) campaign headquarters. For me, there was no “damn near” about it. If I didn’t make it out before the rallies started, it could well over an hour before I could leave my house as the parade of boisterous supporters inched their way towards the pueblo. DIY PIZZA PARTY WITH CLOSE FRIENDS! 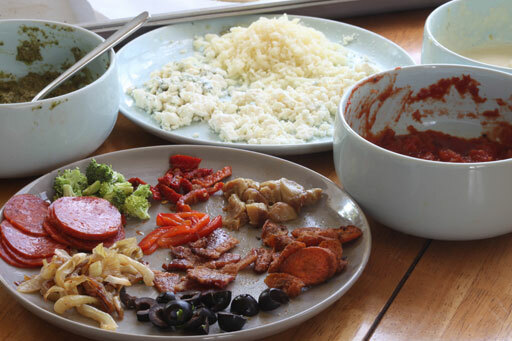 This is a shot of the remainder of my pizza mise-en-place after we had pillaged the toppings and spooned out most of the sauces while baking up our pizzas. Our topping options consisted of: caramelized onions, pepperoni, broccoli, sun-dried tomatoes, roasted red peppers, roasted garlic, curry roasted carrots, bacon, black olives, feta, blue cheese & an italian cheese blend. While the toppings were exciting in and of themselves, the sauces are what really made these pizzas special. We had a basic red sauce (for purists), a rich garlic, asiago & parmesan cream sauce, and a spicy roasted jalapeno, culantro & pecan pesto. And let me just say, that pesto is one of the best things I’ve made/eaten in ages! It’s like crack! Granted I love any and all things spicy, so there is that. Below is the recipe for the garlic, asiago, parmesan cream sauce. It’s so rich and so delicious that a little goes a long way! I even used it as a drizzle on top of of a pizza with the roasted jalapeno pesto as the base. O.M.G. So. Good. And don’t worry, tomorrow I’ll post the recipe for the pesto so you guys can get your hands on the crack as well. PS – for my dough I used this recipe of Nicole’s – the only thing I really changed was replacing the whole wheat flour with another cup of all purpose and omitting the rosemary. I don’t do it very often, but I loooooove cream sauce on pizza! And those toppings sound great! It was so much fun when we did that with Corinne and Jason in San Diego!